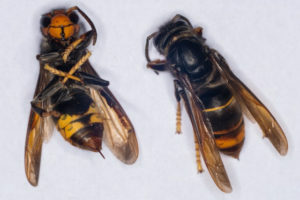 Asian hornets have recently claimed the life of another victim in France. The man, a 57-year-old from Normandy, died at the scene, while another woman had to be treated in a hospital after being stung several times. This fatality is just the latest in a series of deaths caused by these pests. In August, a French Farmer was stung by an Asian Hornet while driving his car. A few minutes later, he fell unconscious and ran his car into a pole. He died from a severe anaphylactic shock. Another woman from Normandy recently died after suffering a similar reaction. She was stung while tending her garden. The hornets have attacked about 180 people in that area during the past three months. The Asian hornet (Vespa velutina), which grows up to 1 inch long, is indigenous to Southeast Asia. It is believed that these hornets were introduced into France through a delivery of Chinese pottery, back in 2004. They have since spread throughout most of France, Portugal, Spain, and are now in the U.K.. These hornets are aggressive and are known to attack people who get within 10 feet of their nests. Because of their large size, their stings are far more serious than those caused by honeybees. French authorities are warning people to be extremely cautious. Anyone who is stung should immediately call for emergency services because of potential allergic reactions. Asian hornets are highly effective hunters of a wide range of insects. Besides the risks to humans, beekeepers are very concerned that these hornets are causing significant losses to honeybee colonies. A handful of Asian hornets can destroy a nest of 30,000 bees in only a couple of hours! British scientists say they have made a breakthrough in the fight to stop the spread of Asian hornets. They are now capturing these hornets, and placing electronic tags on them so they can track these pests back to their nests. Once located, the hornet’s nest can then be destroyed. Asian hornets have not yet made it onto our shores, but it is probably only a matter of time before they do.